This title is suitable for ages 3-5 years. When is it time for a hug? Anytime! 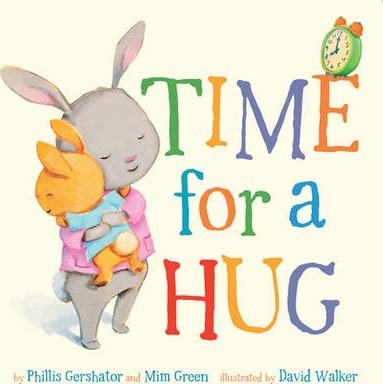 This feel-good story - now in the popular board book format - assures kids there's plenty of love to go around-the-clock. From the moment Little Bunny wakes up in the morning until the moon comes out and the stars shine, every hour includes a warm hug from Big Bunny. Whether they bake or build, bike or hike, a caring hug always feels just right. This is a book that is generous with love, and full of the sweetest illustrations you've ever seen. Phillis Gershator has written many picture books for children. Her mother, Mim Green, inspired this collaboration. To learn more about Phillis and Mim David Walker is the illustrator of numerous children's books, like Crocodaddy (Sterling).